Featuring metal frame with matte finish. High contrast clock face that's easily readable for anyone. It is truly an attractive yet functional timepiece! The clock is 6.5 inches tall, 4.5 inches wide and 2.5 inches deep. Metal frame with midnight black matte finish, Built-in backlight. Powered by 1x AA battery. STYLISH DESIGN - Featuring metal frame with matte finish. High contrast clock face that's easily readable for anyone. It is truly an attractive yet functional timepiece! 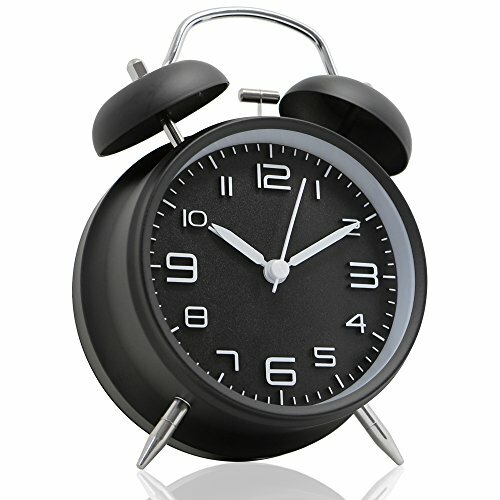 SPECIFICATIONS - The clock is 6.5 inches tall, 4.5 inches wide and 2.5 inches deep. Metal frame with midnight black matte finish, Built-in backlight. Powered by 1x AA battery. View More In Mechanical & Wind-Up Clocks. Baidercor Roman Numerals Twin Bell Alarm Clock with Nightlight White 4"